Visiting Copenhagen tradeshow Revolver (30 Jan.-1 Feb.), you know what you’ll get: a big dose of Scandinavian names with a sprinkling of international contenders. “The fair is very consistent – and we really like this aspect. There are many different types of brands but they all sit nicely together. I also think it makes sense to focus on Scandinavian brands as the buyers from the region typically like to support local brands. 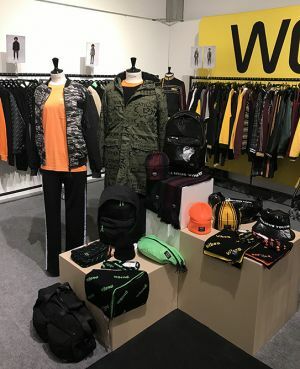 Of course there are international brands and visitors, but Revolver’s got the proportion right,” said Lis Eriksson, owner of the London-based agency Le Works, which brought Libertine-Libertine and Elaine Hersby to the fair this season. Revolver’s international reach has increased, partly due to its ongoing partnership with Pitti Uomo. The so-called Scandinavian Manifesto will bring a new slew of Scandinavian designers to Florence come June 2019. New exhibitors for the season included Marimekko, Garment Project and Jeanerica, while Stine Goya, Heliot Emil and Mfpen were among names on the official CFW catwalk schedule, showing as part of Revolver Runway. Here, half a dozen highlights from across the fair landscape – from merino beanies and personalized raincoats to denim jumpsuits. Danish rainwear brand Rains had set up a pop-up workshop at Revolver to demonstrate its new Rains Edit concept – a personalization service inviting customers to jazz up raincoats (black or yellow) with their names/initials or fun symbols such as eyes and raindrops, as well as a choice of hardware and drawstrings. Danish Navy-inspired knitwear specialist Andersen Andersen is turning ten in 2019. To celebrate, the brand has brought out some of its classic merino wool pieces – including beanies, sweaters and scarves – in a new color: orange, the same hue as its distinctive neck-tag. Jeanerica Jeans is one of Sweden’s hottest new denim exports. Making its Revolver debut, the brand had lined up a good portion of its offerings, spanning jeans in different fits, plus denim jacket and tees. Organic cotton is used almost exclusively across the range, which centers on carry-over product designed to stand the test of time. Newness comes in the form of color – freshly introduced denim shades for FW19 include an icy pale lilac and a fudge-y beige. Forét defines its aesthetic as outdoor-inspired streetwear and it’s a pretty apt description. But style is only half the story. This season-less, slow breed of menswear is made to last, using organic or otherwise sustainable materials where possible. Many of the shirts, such as the pictured anorak-style piece, are crafted from cotton canvas, made sturdier (and more covetable) with the addition of taping. The feel of Wood Wood’s outdoor-inspired FW19 collection is delightfully tactile in a homespun, slightly retro way. We were drawn to this brown and off-white men’s knit, channeling what we thought was a definite snow, ski and mountain vibe. Copenhagen-based brand Blanche is known for its distinctive denim offerings. A wide array of FW19 fits was displayed at Revolver, with a focus on straight and wide silhouettes. Figure-hugging coats formed part of the denim outerwear range, while an all-over logo-printed jumpsuit added a sense of fun to the collection.